PCC Austin Produce Market’s fifth season begins Tuesday, June 2 with a new twist: organically grown produce grown on-site by PCC Community Wellness Center. Instead of just telling patients to eat well, the community health center is providing easy access to produce within the Austin community. Produce grown on the farm will be harvested and sold at the market. First harvest picks will include mustard and collard greens, kale, radishes, lettuce and scallions. This summer, the market will be held every Tuesday through October 27 from 12 to 6 p.m. as well as the second Saturday of each month from 10 a.m. to 2 p.m. (June 13, July 11, Aug. 8, Sept. 12 and Oct. 10). Selling produce to nearby distributors and food service organizations will contribute to self-sufficiency. By cultivating a farm, PCC hopes to help meet Austin and neighboring communities’ need for produce and to help alleviate health issues, such as obesity, that thrive in food deserts. The PCC Austin Community Farm, located at 330 N. Lotus Ave., broke ground last year on its community farm, which was established in partnership with Chicago Botanic Garden’s Windy City Harvest program. 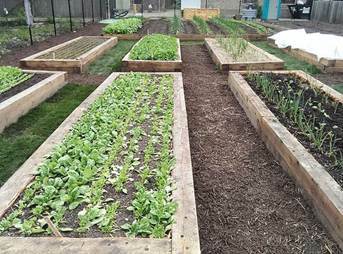 Experts in urban agriculture, Windy City Harvest staff built the farm and will maintain the site for the first three years of operations. During that time, PCC will recruit community members who are interested in participating in Windy City Harvest’s certificate program in hopes of finding a permanent, local farm coordinator. Through this endeavor, PCC will engage community members in volunteer opportunities as well as farming and nutrition workshops. Funding for the project was awarded by the Humana Foundation in 2014. Locally grown vegetables will be sold every Tuesday from 12 to 5 p.m. and the third Saturday of each month from 10 a.m. to 1 p.m. until October 25.